This simple setup will give you access in minutes to specific modules or all of Meet The Need - it's quick to start. How Can We Mobilize our City to Serve Year Round? You're making progress in your city. You've built a network. Meetings are taking place. Collaboration is starting to occur around occasional events and initiatives. But it seems hard to maintain momentum and mobilize people to serve those in need year-round. You realize the process for connecting needs with those who can help is broken. There's so much need but little awareness of those needs within churches and businesses. In fact, you exist in part to help bridge those communication gaps. But all you have at your disposal are the same outdated methods for sharing that are being used by your local charity and church partners – emails, calls and newsletters. Unity doesn't come from convening pastors and charities into a room on a regular basis. Even if those pastors agree to get involved in collaborative charitable efforts together, each of them still has to figure out how to communicate needs on a regular basis to all of the members they represent. That task is simply not possible from the pulpit and the bulletin. City reaching leaders have learned that city movements are most successful when their goal is empowerment versus ownership. In other words, rather than starting initiatives and trying to get churches and businesses to provide you money and volunteers, focus instead on helping those organizations be more effective in impacting their communities. Meet The Need is the only organization to ever build a platform to fix the fundamentally "broken" processes for making those who can help aware of local needs. Church staff is no longer the bottleneck. Charities post needs and, instantly, church members and employees of local companies can view and search for opportunities that leverage their skills and interests. Families walk into churches or charities and administrators know where they've already been and what help they've already received from other organizations. Suddenly, coordination across the city becomes possible, with you as the catalyst for a permanent change in how the city communicates needs and collaborates to meet those needs. Unity is a tough message to introduce when each church and charity has their own unique interests. But they would all like to increase their impact in the community while taking work off their staff, all with no required fees. So your mission of uniting and mobilizing your city to do more to serve those in need gets accomplished as you share Meet The Need with local organizations. Because it is so rare that anyone will say "no" to Meet The Need, unity naturally occurs as a byproduct. Widespread adoption of a common platform for serving the city means you're making huge strides toward collaboration. Local needs for volunteers, resources, events, drives, and families are being shared across many organizations "behind the scenes" automatically. Meet The Need is a powerful example of empowerment, GIVING churches and charities all the tools they've been lacking for so long to efficiently managing their own local charitable activities. Because Meet The Need is private-labeled, needs posted by a local charity appear instantly on your city-reaching web site and Facebook page, as well as the web sites of local churches, businesses, and the charity's own website. And all of it looks exactly like your web site and each of their sites. When a local charity posts a need for 30 volunteers or 100 blankets that same need is seen on their "Volunteer" button or "Most Needed Items" buttons. Simultaneously, members of local churches and employees at local companies see those exact SAME needs on the "Serve the Community" button on their church's and employer web sites. Individuals and groups commit to meet those needs through any of those web sites, and the remaining number of volunteers and items needed adjusts automatically across all sites. No more sign up sheets or spreadsheets. No more, divide and conquer where "our church will do this" and "yours does that". Instead, the same needs for city wide events appear on the web sites and Facebook pages of all participating organizations (including yours). So people from different denominations, churches and other walks of life end up at the same locations, working together. Also, local toy, backpack and food drives are no longer done "in a vacuum". Meet The Need show all participating organizations where each family is already booked – no more booking families for the same drive multiple times. 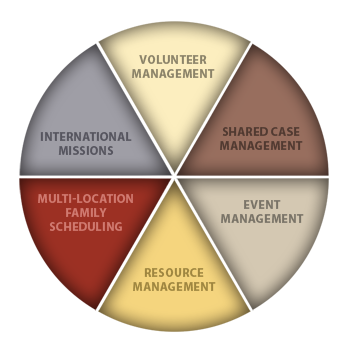 Meet The Need provides all organizations in your city with a powerful Shared Case Management system. Administrators for local charitable organizations and churches, including you, will know "who has been where and gotten what from whom". Family needs are also shared with those who can help, anonymously, with privacy and security of information as the highest priority. "We now know who is doing what for whom across…"
Tampa Bay is probably the most connected community anywhere in the world thanks to Meet The Need. Most of the largest churches and ministries use Meet The Need as a shared platform for volunteering, events, helping families in need, running charity drives, etc. During the 2012 Holiday season alone, more than 50% of all church/ministry holiday serving activities in Tampa Bay were facilitated through the use of Meet The Need - including all the Holiday Tents, Toys for Tots drives, Thanksgiving food drives, Metropolitan Ministries, Salvation Army, Hope Children's Home, Habitat for Humanity, etc. For years, a small unified group of pastors collaborated annually for a community-wide outreach event called Feed The Bay. In 2009, just as Meet The Need began its initial "Beta tests", Feed the Bay decided to use Meet The Need to make it easier to register volunteers from multiple churches at multiple locations. This impact continues to be felt year-round as the spirit of collaboration city-wide is truly moving families toward self-sufficiency with the local church leading the way! How does Meet The Need help us mobilize and connect the city to serve? We solve the largest impediment to effective city-reaching, the breakdowns in communication between those who need help and those giving help. We empower you to be the catalyst for the transformation of your city into a more compassionate and caring community. And we do so leveraging what has been shown to be the most effective model for city reachers - by empowering local organizations rather than trying to get them to support your initiatives. What are our options for showing local volunteer, resource and event needs? You become a "hub" of local serving opportunities, showing all needs you'd like to highlight in the community. It may be 10 large local charities, with special buttons on your web sites showing the needs of each one. It could be a big event coming up and you want to be a registration site. Or maybe it's local families who you want to see get help, so you show their needs (posted by other local organizations) on your web site. Why does Meet The Need want to partner with us? We share your exact same mission, but you have the local network and we have the technology. Neither of us can unite and mobilize your community to bring far more help and hope to those in need without working together. Because we don't charge for any of our services and organizations rarely say "no" to Meet The Need, Meet The Need doesn't need to have employees in your city knocking on doors. We simply ask you to help get the word out about Meet The Need so that we can accomplish our shared vision for your city. What tools do we get for our own use? You get all the software you'll ever need to run events, request volunteers, help families in need, schedule charity drives, and get in-kind donations. You're not just helping other organizations become more efficient by sharing Meet The Need with them, you'll have all of our tools at your disposal as well to help you run your own initiatives more efficiently. This page loaded in 0.00504 seconds.